Dr Dhiraj Marothi, an MCh (Orth) Dundee graduate from 2009, received “Best Paper Award” at the 18th Annual Scientific Meeting of Asia Pacific Arthroplasty Society (APAS). There were 53 Papers presented at the conference. Dr Marothi’s winning paper was entitled ’Ninety days morbidity, mortality and functional score in patients undergoing primary TKR’ and was conducted at Shalby Hospitals, Ahmedabad, on 2000 TKR patients. The President of APAS, Dr Parag Sancheti, is also an Alumni of the MCh (Orth) Dundee course from 2003. Dr Marothi and Dr Sancheti regularly lecture here in Dundee at the TORT Centre and remain staunch supporters of the MCh (Orth) degree course. Left: Dr Marothi recieving his award from Dr Rami Sorial (Immediate Past President); Right: APAS Executive Committee with Dr Sancheti in the centre. APAS 2017 conference was held from 18th - 20th August, 2017 at Hotel Leela, Chennai, India. The first day of the meeting comprised pre-conference workshops and company sponsored sessions with the remaining two days focussing on various aspects of hip and knee replacement surgery. There were debates on controversial orthopaedic topics, symposiums, clinical case discussion and keynote lectures from experts in their fields. 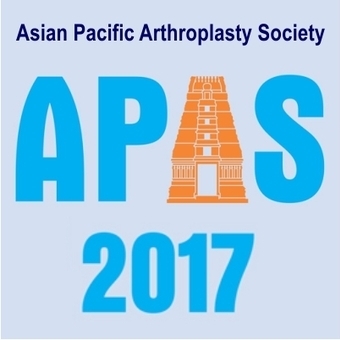 During APAS 2017, the topics on hip and knee were covered. The total number of registrations were 675 and in two days, more than 3500 online logged in also. The national and international faculty, totalling 49, delivered extremely informative talks. Dr. Parag Sancheti also delivered his Presidential Speech at the meeting which was appreciated by all.